Hello Everyone! Have you missed me? It seems like forever since I posted. I went back to work three weeks ago and I've been too tired to post. Not that I don't have a lot of reviews to post, I just was so tired every night I just vegged. I am going to try and do better so that I can get these reviews up. AND I couldn't miss Digit-al Dozen Week! I haven't missed on yet! This month we are re-creating past designs by other members. It took me awhile to narrow it down. There are just so many amazing designs to pick from! I am going to post my re-creations in the order of the week they appeared. My first design comes from the DD's second week, Blue Week. I knew I had to re-create an early design and when I saw (remembered) this one from Bee Polished I had to re-create it! I started with two coats of Elderberry. I do not have the colors that Bee used so I used ones close to them. 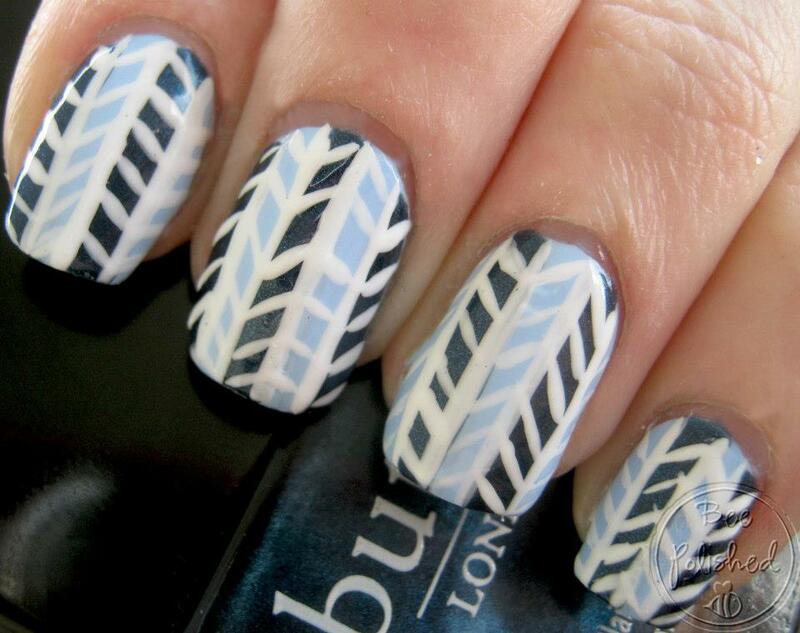 I added my dark blue stripes using a nail art brush and Catrice George Blueney. Instead of using a white polish, I decided to try acrylic paint for the first time. I am loving the acrylic but I thought my lines were a tad too thick. Actually I think I made my blue stripes too thick and that messed it up. Plus I couldn't remember which way to do my lines! I love the look that Bee created, the blues and pattern are awesome! I think my nails are a little smaller than Bee's and it doesn't look as nice. There are things I would change, specifically the lines, if I did this look again. Thanks for the inspiration Bee! Make sure you stop by and see what the other ladies did! Ohh I love this! Your lines are so crisp! This looks fab. I LOVE the pattern, and your lines are so neat and clean. this is a spot on perfect version! and from the frist official DD week!